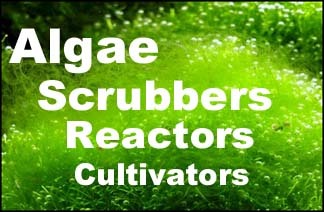 Scrubbers are known to grow the algae actively, but it is mainly plant mass. I was curious to try to find out how much of this biomass are actual waste products exported from the tank, and how much is just carbon from the atmosphere. By knowing this we could scientifically estimate the real efficiency of a scrubber. As a starting point I am going to use the Redfield ratio. American oceanographer Alfred C. Redfield empirically determined and described in an article written in 1934 that carbon, nitrogen and phosphorus in plankton are present in the ratio: 106 : 16 : 1. Which means that in planctonic mass to 1 phosphorus atom there are 16 nitrogen and 106 carbon atoms. For simplicity lets consider that a plant cell mainly consists of cellulose, nitrate and phosphate. Of course many other elements are present, but these are the bulk substance. 4 grams of grown dry substance would export 1000mg of nitrates and 100mg of phosphate. Suppose we have a 100 liter (about 25 gallon) fish tank with 25ppm nitrates. This comes to 2.5 gram of nitrate ion in the system. To remove this completely the scrubber will have to grow about 2.5*4=10g of dry algae substance (at the same time it will consume about 250mg of phosphate which for the considered system is equivalent to 2.5ppm.) This sounds reasonable to me (providing that the real wet mass of algae will be probably 100 times heavier compared with the dry mass obtained through calculations above. 10 grams of dry plant substance is a lot and, having such growth in the long run, I am sure that the scrubber will soon deplete the tank of any iron and may even affect the potassium level (although it is relatively abundant in marine water). I have never seen this discussed, but it might be a good idea to start dosing iron (and maybe other microelements too, like the Plantex CSM mix which is well known to planted tank owners) to promote the growth of plant mass. Guys, tell me your opinions on the above speculations, please. Also, did anyone ever weigh the mass of turf grown by a scrubber, both wet and dry: how much approximately is grown by each sq. inch of scrubber screen in a week? Also, how does a scrubber behave if the proportion of available nitrates and phosphates is different from roughly 10:1. For example, if the ratio is 10ppm nitrate and 5ppm phosphate, the scrubber should "eat" 10ppm nitrates with 1ppm phosphate and the remaining 4ppm phosphates will stay in water since the nitrate will be a limiting factor to the growth of algae? Does it make sense to slowly dose some nitrate in the system (40ppm in all) to promote algae growth until the accumulated phosphate is fully consumed? The tank with living critters naturally makes nitrate so there is no need to dose it IMO. Sure. The queestion concerns the proportion between produced nitrates and phosphates. I have seen tanks where phosphates accumulate while the nitrates are close to zero, and vice versa. I don't know why this is different. In the mean time, based on Redfield ratio (I do not think it can be overriden) I am assuming that scrubber's consumption of nitrate to phosphate should be in 10:1 proportion, which may lead to nitrate deficiency while the phosphate is still there. Here is why I suppose that certain systems may require additional nitrate dosing. In this case I think, Calcium nitrate or Potassium nitrate may be a good idea. Sure it'll be different. I am looking to hear average figures, which may be perhaps 5 times different depending on conditions, but this would give us a basis for a rough estimate of scrubber's capability of drawing nitrates and phosphates. I am certainly on board with your thoughts. I believe the same thing, nitrates are taken in by algae at a much greater rate than phosphates and on a scrubber only system it is very easy to get 0 nitrates and have phosphates continue to climb. Seen it happen on many tanks, including both of mine. I have to use other phosphate removal means to keep them steady. My goal is not, nor has ever been, to keep Nitrates and Phosphates at 0, I want both in my system. My ideal readings are 10 nitrates and .09 phosphates, but I have found it extremely difficult to maintain nitrates at that level, actually impossible for me (but I have never dosed nitrates, but I have thought about it many times). Excess phosphates are the main reason I soak and rinse all my food before I put it in the tank, it is amazing how much phosphates is in a cube of food (were frozen cubes = 90% water, and that water is super high in phosphates). I have no idea how to explain the tanks where there are nitrates present and no phosphates, that one is a head scratcher to me. Unfortunately I do not have any real data to show other than pictures of my weekly tests, but those are hardly what I would call scientific. I have not weighed my harvest in quite some time, and it does vary week to week even if I try and keep all other parameters the same. After all is said and done though I do believe my system follows the Redfield ratio, that one is not really debatable in my opinion. CO2 is just along for the ride. So is hydrogen. Your concern should be N and P.
By knowing this we could scientifically estimate the real efficiency of a scrubber. Efficiency is 100 percent, if it is a scrubber-only tank: All nutrients put in will be exported by the algea. Search for "iron" in the search box. how much approximately is grown by each sq. inch of scrubber screen in a week? Ratio does not seem to matter. Green hair algae takes what it needs. What does matter is the absolute levels of nutrients: Higher levels grow darker algae or turf, which are not as good at filtering. No. Every feeding, or fish peeing, or coral mucus-ing, puts more nutrients into the water, and does so in a Redfield-balanced manner. I have seen tanks where phosphates accumulate while the nitrates are close to zero, and vice versa. I don't know why this is different. They are accumulating not because of different amounts being put in, but by different amounts of filtering. Non-scrubbed tanks have very weak phosphate removal, because there is nothing to remove the phosphate. Once the rocks are "soaked", any P put into the water will stay in the water. P is not removed by skimmers, socks, sulphur reactors. Waterchanges or vodka/pellets will remove P, but they remove N too, so they don't bring the P down fast enough. Thus P accumulates. Algae, however, removes N and P at the Redfield ratio. This can happen with rock that is not saturated, and is absorbing P. This occurs any time nutrients have been low for a while, and have just increased. The increase in N will show up in the water, but the increase in P goes into the rocks. For the purposes of reef keeping all we need to know is that it will export sufficient waste from our systems. And we know that from the results. All the nutrient export info makes sense. What does not make sense to me is why Ace25 is attempting to maintain nutrient levels many times higher than those on a natural reef. It is well known that even if you have readings of zero for nitrate and phosphate the levels will still probably be higher than natural levels due to the insensitivity of the readings. Here is your answer dtyharry in the link below. Hanna Phosphate meters (the $200 kind which I use) have an error range of +/- .04. If I try and keep mine at .09, that means it could be .05-.13, still perfectly acceptable for my tanks. Nitrates at 10.. well... I would like to have them at that, but I can't get them to go above 0 even on a meter, so nitrates are a non issue although I still prefer 10, and I have not read or heard of anything to say 10 nitrates are harmful in a tank, actually the opposite, corals require phosphates and nitrates to grow. Sure, even at 0 readings there are some of both in the tank, but I like to have a little extra just to be available in the water column since it doesn't appear to cause any harm at levels that low and will be readily available to corals if they should need it. This is just what I feel works best for me on my tanks after spending the last 20 years playing around with them. I am not saying my way is the best way or that anyone else should do what I do, just what I have found to work good for me. very interesting link ace. something that never entered my mind. The scrubber I run keeps the N at rock bottom zero. So much so that when I took the scrubber offline for over a week and moved the entire system, it stayed below 5ppm the whole time.